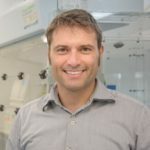 Alessio Ciulli research interests are on the development of small molecules targeting protein-protein interactions (PPIs) and inducing protein degradation. His group has made significant contributions to selective chemical intervention on important PPI targets. Initially in collaboration with the Crews Lab, they pioneered the structure-guided design of drug-like ligands for the von Hippel-Lindau E3 ligase. This discovery helped to realize targeted protein degradation as a revolutionary new modality for therapeutic intervention and has led to significant commercial impact across academia and biopharma worldwide. In 2009 Alessio started his independent career and his Alessio’s Lab has illuminated important structural and mechanistic insights into the molecular recognition and mode of action of PROTAC degrader molecules.